Centaur – Next Hipster Trend is what's HAWT, NEXT! Serene and volatile, You too can Centaur this. Perviously HWTNXT:HipsterTrends has advocated for animal proxies to become the standard bearers for the “nxt-of-times.” But, now, charging forward through the pillowy myths of time, comes the perfect totemic symbol for today, the Centaur! 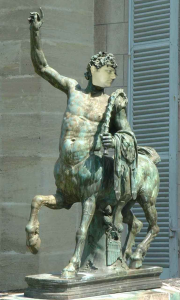 At once brash and barbarian, then pivoting to be wise and sensitive, the centaur is the perfect anthropomorphized icon for our troubled times. Think of being a centaur like having a super brash and “transbeast” way to respond to any challenge in life. Half human half horse, all business! Probably why the epicenter of interest is the Ukraine. Not just the uncouth partiers of Percy Jackson, centaurs have come to represent the internal clash between our base instincts and cultured sensibilities, fertile stomping ground for a cutting edge hawtster like you. With the recent discovery of a habitable Earth like planet around Proxima Centauri, our nearest stellar neighbor only 4 light years away, the time of the the centaur has arrived. How-to Hawt: When Bobertta (your ineffectual human manageress) decides it’s time for a punitive “performance review”, don’t cower under your cubicle tangled in ethernet and mouse cables in sweaty heaving, NO! Stand immediately forcefully shoving your throne ( ill fitting and inanely named task chair from Sweden ) back – allowing it to roll into Seth’s cubie across the way with authority. Then, reaching spread eagled with fingers out, take a chest exploding deep breath, stomp a nubby toe-boxed keens loafer down, SNORT and exclaim, “By the daughters of the Lapithae, it is time!” With a hearty whinny-laugh, do your best Churchill Downs pre-race clopping down the hallway to her office. Glance about as if you are returning from a battle. As centaurs always have one raised eyebrow, change them frequently during the review. Centaurs luxuriate in their chest hair, even female Centaurs, so don’t hold back, a medical grade comb can accentuate this. A true centaur would remember that this is their performance review, not the manager’s, so own it and know you’re HAWT!